I’m always looking for new ways to add more value for my readers and also to SEO all of my pages the best that I’m able. A few months ago, on my top earning niche site, I noticed that one of my category pages was getting a lot of click throughs. I decided to add some text and an image up at the top of the category page to make the page more interesting, helpful and to lower the bounce rate some. Over the past 2 months, the rankings for that niche site have been slowing increasing and as of this month, I’m in the top 5 on Google for a number of key search terms for the site. One of them is the category page I mentioned above. Yes, that’s right, I have a category page ranking in a #4 spot on Google for a 4,400/month keyword. Best part? It’s a buy keyword too. I gotta be honest, that’s a first for me. I’ve never had a category page rank, and even being more honest, I never really thought to try. I should have been doing this for years! Definitely feeling a bit stupid right now. But you live and learn right? I also linked out to one of my other more popular and related articles. Now, some you more perceptive types might notice that I missed a few keyword optimization items. That was intentional. Given the small amount of text, I didn’t want to keyword stuff it. To be honest, I’m a little concerned I might have gone a bit too far as it is, but we’ll see. If I don’t see it ranking soon, I’ll revise the wording some to cut back some on keyword use. I’m running the Genesis theme on all most of my sites, except this one (I’ve just been too busy/lazy to convert it). More specially, Metro Pro is my goto Genesis child theme. But more on that in a sec. If you’ll login to your WordPress site, hover over posts, click on categories, you’ll see the all too familiar category page. In the list of categories, you’ll see name, description, Slug and Posts. I’ll bet for the majority of you, the Description fields are empty. That Description field is where we can add the opening text. Now here’s a trick: The Description field only allows you to enter plain text, but it supports HTML. What I do to create my HTML is create a new post, type up the category description, format it the way I want, including adding an image. The I click on the HTML tab, copy the HTML and paste that into the Category Description field. Done. If you don’t have it already, install the Genesis Simple Hooks Plugin and activate it. 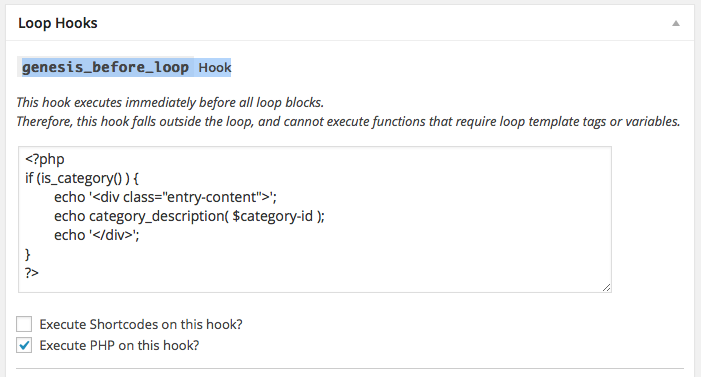 In your Admin Menu, navigate to Genesis>>Simple Hooks and click on Simple Hooks. Also, make sure you check the Execute PHP on this hook box. If you don’t, the code won’t work. Once the code is in place, and the checkbox checked, press the Save Settings button up in the top corner. Assuming you put your description in, and properly followed the steps above, your description text should be showing on your category page. If you run into issues, just add a comment below and I’ll do my best to help you out. Make sure you include the URL for your category page so I can take a look at your site. Also, let me know if this helps any of you to get your category pages ranking. Loved this article. Who would have thunk it? 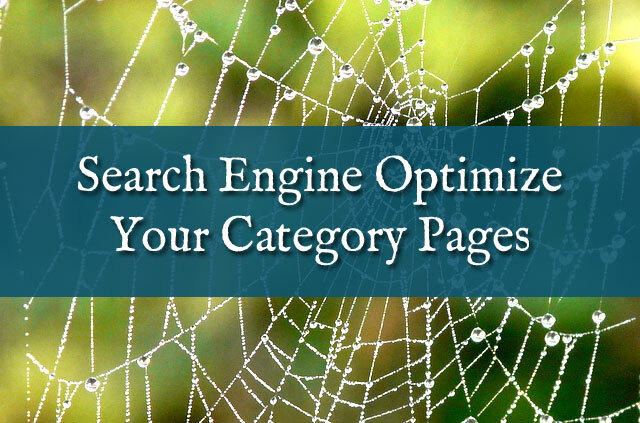 SEO for your category pages. Great write up and a good to for help! Good stuff! I’ve added a couple of descriptions to a few of my category pages but not to the extent you have done. Thanks for the Metro tips! I popped to http://blueridgemountainlife.com/hiking-trails-blue-ridge but couldn’t make out where this category optimization code was in place? Thanks Charles, keep me posted on how it does on your sites. Hey Glen and you’re welcome. Neil, it’s the text at the top of the page, before the listing of posts. Guess who’s awesome? You are. 🙂 Adding these to one of my sites to test it out! i will keep you posted on how it goes.